Calling all lovers…of historical fiction! 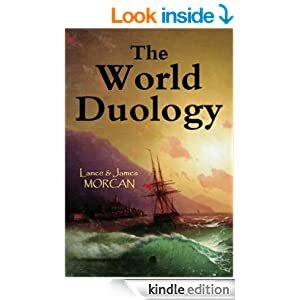 Lovers of historical fiction will be pleased to know the Kindle ebook price of our new release series The World Duology (World Odyssey / Fiji: A Novel) has been slashed as part of our book launch. Readers will receive two novels in one at a real sharp price until the new book launch promo ends February 9th PST. Meanwhile, World Odyssey and Fiji: A Novel, books one and two in the duology, remain regular visitors to Amazon’s bestseller lists in their appropriate categories in historical fiction. And readers continue to resonate with both novels if reviewers’ ratings and comments are anything to go by. Set in the nineteenth century, The World Duology follows the fortunes of three young travelers. Their dramatic adventures span sixteen years and see them engage with American Indians, Barbary Coast pirates, Aborigines, Maoris and Pacific Islanders as they travel around the world – from America to Africa, from England to the Canary Islands, to Australia, New Zealand, Samoa and Fiji.